Roshi (老師) is a Japanese word, common in Zen Buddhism, meaning «old» (ro) and «teacher» (shi). 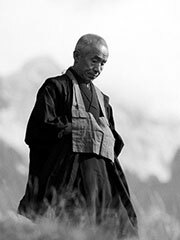 Roshi can be used as a term of respect, as in the Rinzai school; as a simple reference to actual age, as in the Soto school; or it can mean a teacher who has transmitted knowledge to, and thus «given birth» to, a new teacher. The equivalent Chinese term, lǎoshi (simplified: 老师) is used in modern Chinese in a much more limited sense, normally meaning simply an ordinary teacher.